I'll start this day meditation with a confession : I never called Jaint Joseph only husband of Mary , because Saint Joseph is the chaste spouse of Immaculate Mother of God . We know also that he was a carpenter, a working man, for the skeptical Nazarenes ask about Jesus, "Is this not the carpenter's son?" (Matthew 13:55). Despite his humble work and means, Joseph came from a royal lineage. Luke and Matthew disagreed some about the details of Joseph's genealogy but they both mark his descent from David, the greatest king of Israel (Matthew 1:1-16 and Luke 3:23-38). Indeed the Archangel Gabriel who first tells Joseph about Jesus and greets him as "son of David," a royal title used also for Jesus. We know Joseph was a compassionate, caring man , devoted to his Holy family and God . We know Joseph was man of faith, obedient to whatever God asked of him without knowing the outcome. When the angel came to Joseph in a dream and told him the truth about the child Mary was carrying, Joseph immediately and without question or concern for gossip, took Mary as his wife. When the angel came again to tell him that his family was in danger, he immediately left everything he owned, all his family and friends, and fled to a strange country with his young wife and the baby. He waited in Egypt without question until the angel told him it was safe to go back (Matthew 2:13-23). More that this we know how much Saint Joseph loved and adored the Saviour of mankind and Redeemer of the world . His one concern was for the safety of this child entrusted to him. Not only did he leave his home to protect Jesus, but upon his return settled in the obscure town of Nazareth out of fear for his life. We celebrate two feast days for Joseph: March 19 for Joseph the Chaste spouse of Mary and May 1 for Joseph the Worker. There is much we wish we could know about Joseph -- where and when he was born, how he spent his days, when and how he died. But Scripture has left us with the most important knowledge: he was -- "a righteous man" (Matthew 1:18). God the Holy Father chosed , in His infinite wisdom , Saint Joseph to guide and guard His Son, Jesus Christ, and the Blessed Virgin Mary. 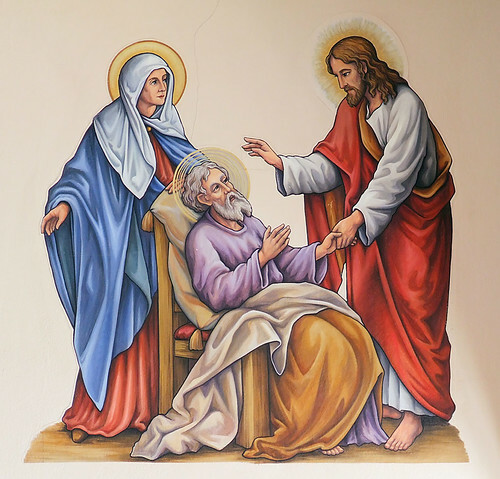 In these prayers, we turn to Saint Joseph and ask him to guide us as a father would. The path of Saint Joseph through his earthly life was a quiet hidden one. The same may be said of his devotional path through the Christian centuries. Many have carried him silently in their hearts, have looked at his statues in the Christmas stable scene. And they have understood that he was an intimate, important part of the silent night when a Star shone from above, and the song of the angels joined the praise of the shepherds. But, as Cardinal Newman has pointed out, Joseph himself was long a star dimly seen in devotional practice, a man quietly loved by many, but waiting, so to say, in the vestibule until the strong voices of Saint Bernardine, Saint Teresa of Avila and others summoned him into the sanctuary. It was only in 1870 that Pius IX declared him universal Patron of the Church and extended his major feastday to the whole Church. Pope Pius XI invoked him as the saint whom we should call upon to defeat atheistic communism. Pope Pius XII, for his part, proclaimed the Feast of Saint Joseph the Worker (1 May) as a counter-point to the May Day celebrations held throughout the communist "workers paradise" world. 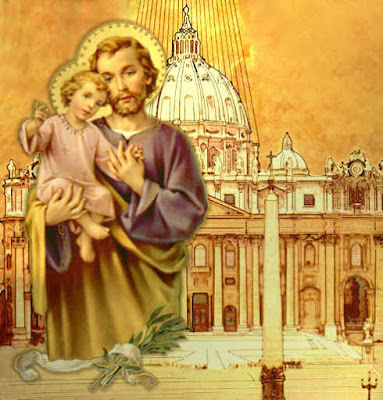 Saint Joseph is, as we all know, the Patron of the Universal Church. Along with Mary he is one of the most honored saints in the entire array of saints found in the life and history of our Church. It is fitting that this be so - he was next to Mary, the Guardian of Jesus, the link between Christ and the prophetic portrayal of the origins of the Messiah being found in the "House of David". In addition to being honored as the Patron Saint of the Universal Church, he is hailed as the Patron of Workers, Patron of Families, Patron of the Sick and Dying, and the Guardian Saint of Virgins. He is also the patron of those engaged in the interior life, as well as being the patron saint of those in authority, of fathers, priests, and those placed in charge over the poor and defenseless. In every Catholic Church throughout the world , there is a side alter dedicated to the Spouse of Mary. Before that altar or in the solitude of one’s own home, or under the vault of the open skies, a person can appear to Saint Joseph for aid in life’s struggle. Let us prepare morally and faithfully for one of the Feast of Saint Joseph , let us ask Saint Joseph intercession for all our daily needs and entrust our dear ones to the head of the Holy Family . Happy Feast of Saint Joseph for each all of you ! You looked into eternity and to your everlasting reward with confidence. If our Savior blessed the shepherds, the Magi, Simeon, John the Baptist, and others, because they greeted His presence with devoted hearts for a brief passing hour, how much more did He bless you who have sanctified yourself for so many years in His company and that of His Mother? If Jesus regards every corporal and spiritual work of mercy, performed in behalf of our fellow men out of love for Him, as done to Himself, and promises heaven as a reward, what must have been the extent of His gratitude to you who in the truest sense of the word have received Him, given Him shelter, clothed, nourished, and consoled Him at the sacrifice of your strength and rest, and even your life, with a love which surpassed the love of all fathers. Happy Saint Patrick Feast , may God Bless and keep you all ! I made a lot of changes in my journals templates , I just love to find the best background for my thoughts , meditations and prayers . and throughout the United States and Britain, many Catholics (and quite a few non-Catholics) will celebrate the life of the great apostle to Ireland by eating a meat (corned beef) that he probably never ate and drinking a beer (Guinness) that was first brewed a millennium and a half after the beloved bishop passed on to his heavenly reward. But no matter--on this day, we may all be more Irish than the great saint, but he still has much to teach us about being Christian . Nothing more comprehensive than The Lorica, or Breastplate, of Saint Patrick . It is an Act of Faith (expressing the Catholic teaching on the Trinity and on Christ); an Act of Hope (in God's protection throughout the day and throughout life, as well as in eternal eternal salvation); and an Act of Charity (in the love expressed for God). Saint Joseph, God has appointed you patron of the Catholic Church because you were the head of the Holy Family, the starting-point of the Church. You were the father, protector and support of the Holy Family. For that reason you belong in a particular way to the Church, which was the purpose of the Holy Family's existence. You were the men chosen by the Holy Spirit. 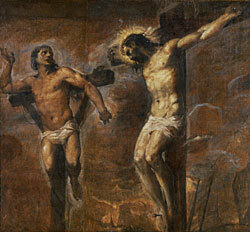 He is the mutual Love of the Father and the Son -- the heart of the Holy Trinity. In His wisdom He draws forth all creatures from nothing, guides them to their end in showing them their destiny and giving them the means to reach it. Every vocation and every fulfillment of a vocation proceeds from the Holy Spirit. As a foster-father of Jesus and head of the Holy Family, you had an exalted and most responsible vocation -- to open the way for the redemption of the world and to prepare for it by the education and guidance of the youth of the God-Man. In this work you cooperated as the instrument of the Holy Spirit. The Holy Spirit was the guide; you obeyed and carried out the works. How perfectly you obeyed the guidance of the God of Love! This union of marriage not only brought you into daily familiar association with Mary, the loveliest of God's creatures, but also enabled you to share with her a mutual exchange of spiritual goods. And Mary found her edification in your calm, humble, and deep virtue, purity, and sanctity. What a great honor comes to you from this close union with her whom the Son of God calls Mother and whom He declared the Queen of heaven and earth! Whatever Mary had belonged by right to you also, and this included her Son, even though He had been given to her by God in a wonderful way. Jesus belonged to you as His legal father. Your marriage was the way which God chose to have Jesus introduced into the world, a great divine mystery from which all benefits have come to us. Saint Joseph, I thank God for your privilege of being the caste husband of Mary. As a token of your own gratitude to God, obtain for me the grace to love Jesus with all my heart, as you did, and love Mary with some of the tenderness and loyalty with which you loved her. I'll post prayers , meditations and many other devotionals in honour of Saint Joseph , most blessed and chaste Foster Father of Jesus Christ , our Lord . Join me in prayers , knowing that the man nearest to Christ Jesus was His Foster Father, Joseph the carpenter. John the Baptist saw Christ briefly near the Jordan and knew that his work as Precursor was over. The Apostles lived and worked with Christ during the brief days of His public life. But Joseph presided over the events of Christ's Infancy, provided for Him the house that sheltered Him from birth to baptism, and was of all the men of earth the one at whose hands Jesus received most in service and love and unselfish devotion. Born of a royal line, Joseph was a carpenter. That trade He passed on to His foster Holy and Sacred Son. Joseph was destined to immortal honors of the Church, yet no spoken word of his is recorded in the Scriptures. Still the Church with good reason is saying out, "Go to Joseph." St. Teresa of Avila had a great devotion and she thaught us to pray and ask merciful intercession of St. Joseph. "I took for my advocate and lord the glorious Saint Joseph and commended myself earnestly to him; and I found that this my father and lord delivered me both from this trouble and also from other and greater troubles concerning my honor and the loss of my soul, and that he gave me greater blessings than I could ask of him. I do not remember even now that I have ever asked anything of him which he has failed to grant. I am astonished at the great favors which God has bestowed on me through this blessed saint, and at the perils from which He has freed me, both in body and in soul. To other saints the Lord seems to have given grace to succor us in some of our necessities but of this glorious saint my experience is that he succors us in them all and that the Lord wishes to teach us that as He was Himself subject to him on earth (for, being His guardian and being called His father, he could command Him) just so in Heaven He still does all that he asks. This has also been the experience of other persons whom I have advised to commend themselves to him; and even to-day there are many who have great devotion to him through having newly experienced this truth." "I only beg, for the love of God, that anyone who does not believe me will put what I say to the test, and he will see by experience what great advantages come from his commending himself to this glorious patriarch and having devotion to him. Those who practice prayer should have a special affection for him always. I do not know how anyone can think of the Queen of the Angels, during the time that she suffered so much with the Child Jesus, without giving thanks to Saint Joseph for the way he helped them. If anyone cannot find a master to teach him how to pray, let him take this glorious saint as his master and he will not go astray." O God, who in Thine ineffable providence was pleased to choose blessed Joseph for the spouse of thy most Holy and forever Immaculate Mother of Christ , grant we beseech Thee, that we may be worthy to have Him for our intercessor in Heaven , whom we venerate as our Protector on earth. Amen. You served the Divine Child with a singular love. God gave you a heart filled with heavenly, supernatural love -- a love far deeper and more powerful than any natural father's love could be. You served the Divine Child with great unselfishness, without any regard to self-interest, but not without sacrifices. You did not toil for yourself, but you seemed to be an instrument intended for the benefit of others, to be put aside as soon as it had done its word, for you disappeared from the scene once the childhood of Jesus had passed. Saint Joseph, I, your unworthy child, greet You. You are the faithful protector and intercessor of all who love and venerate You. You know that I have special confidence in You and that, after Jesus and Mary, I place all my hope of salvation in You, for You are especially powerful with God and will never abandon Your faithful servants. Therefore I humbly invoke You and commend myself, with all who are dear to me and all that belong to me, to Your intercession. I beg of You, by Your love for Jesus and Mary, not to abandon me during life and to assist me at the hour of my death. Glorious Saint Joseph, spouse of the Immaculate Virgin, obtain for me a pure, humble, charitable mind, and perfect resignation to the Fivine Will. Remember, most pure spouse of Mary, ever Virgin, my loving protector, Saint Joseph, that no one ever had recourse to your protection or asked for your aid without obtaining relief. Confiding, therefore, in your goodness, I come before you and humbly implore you. Despise not my petitions, foster-father of the Redeemer, but graciously receive them. Amen. My God, I detest all the sins of my life. Have mercy on me and pardon my offences. 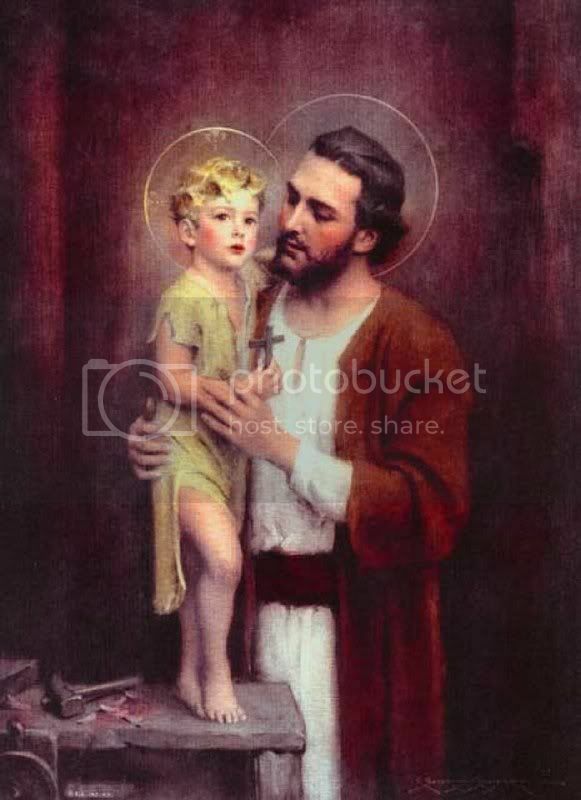 Saint Joseph please receive my contrite soul and spirit , forgive and pray for me ! Pray for us St. Anthony. Make us worthy of the promises of Christ. Almighty and Eternal God, You who in St. Anthony of Padua have given to Your people an illustrious preacher of the Gospel and a patron of the poor and the suffering, grant to us, through Your intercession, to follow Your teachings on Christian life and to experience, in trials, the help of Your mercy. Through Christ our Lord. Amen.